Submitted by Jeff Vincent of Catskill Mountain Wild. A black bear finding food in an apple tree. Photo taken by Matthew Haney on a guided hike with Catskill Mountain Wild. The Catskill Mountains’ popularity is steadily rising with no signs of slowing down. With outdoor adventure at the top of the region’s offerings, some of the most popular destinations are becoming crowded, making the peaceful wilderness experience harder to find. Luckily, the Great Northern Catskills of Greene County have more miles of trail and more high peaks than any other county in the Catskills, making it the perfect place to explore new ground and push the boundaries of your comfort zone. When pushing your boundaries, it’s often helpful to hire a local outdoor guide. Catskill Mountain Wild is one of the top guiding services in the region and helps visitors create a custom outdoor adventure -- including hiking, fishing, camping and paddling tours, and more. Here are some ways to move on from the well-known trails to the less-traveled paths and take your hiking ability to the next level. A breathtaking view from Blackhead Mountain -- one of the highest and more difficult peaks to summit in the Great Northern Catskills. Many hikers are content doing the same handful of hikes every time they visit the Catskills. But as the trails get increasingly more popular, visitors may soon desire the path less traveled. This may mean having to slowly increase the difficulty of the hike, which can be done in a few different ways. More Miles - First, try adding more miles to a destination you’ve already been to. Take the long way instead of the direct route or start at a different parking lot. For example, Kaaterskill Falls is famous for being the tallest two-tiered waterfall in New York State, and there are four parking lots to access it. Instead of finding the lot closest to the waterfalls, choose the route that loops you around North-South Lake. This route offers breathtaking views of the Hudson River Valley and magical forests while increasing the length of the hike, making it a full-day experience. More Elevation - Next, choose a destination that’s higher in elevation. Find the elevation of a hike you’ve already done and increase that number by 250 feet for your next trek. Then 500. Then 1,000. As your legs slowly build up “mountain muscle,” you’ll find your ability to do harder hikes gradually increases as well. More Rocks, More Roots, More Rugged - Many of the trails in the Catskills are riddled with rocks, roots, mud and fallen trees. Start seeking these trails out instead of the gravel-packed nature walks you usually do. The tougher terrain may slow you down, but it will help you find new hikes the average Joe isn’t looking for while pushing yourself to explore new trails. With hundreds of miles of trail in the Catskills, finding a more strenuous hike won’t be the hard part. There’s an endless wilderness to explore -- who said you need a trail to hike, anyway? There are hidden waterfalls, vistas and mountains all over the region. In fact, almost half of the high peaks in the Catskills don’t have a marked and maintained trail leading you to the summit. To reach these peaks, hikers must use a map and compass to navigate the terrain and find their way to the top. These “bushwhack” hikes often lead you to places with fewer people, hidden views and a strong sense of adventure. Hidden waterfalls that are only accessible by a bushwhack. Melanie and Kristina finding their way around ledges on a guided bushwhack with Catskill Mountain Wild. Leave your machete at home, though. “Bushwhacking” is just the term used to describe off-trail hiking. A true outdoor enthusiast will leave the vegetation as they found it and find a safe and suitable route through the dense forest. With bushwhacking comes a plethora of new dangers to prepare for. Researching and leaving your plan with someone at home is a smart idea before entering the backcountry. Getting lost or hurt on a trailless hike doesn’t make for an easy rescue, so this is a good option for experienced hikers. Less experienced hikers should hire an outdoor guide to reach these destinations safely. Catskill 3500 Club - The Catskill Mountains have 35 peaks higher than 3,500 feet in elevation (18 of those peaks are located in Greene County). If you frequent the Catskills, consider documenting the peaks you climb; once you prove you’ve climbed all 35 mountains, you can join the 3500 Club. The Catskill 3500 Club patch, which you can proudly flaunt once you’ve climbed all 35 high peaks in the Catskills. Catskill All Trails List - There are currently 347 miles of maintained hiking trails in the Catskills, with new trails being built every year. These are trails of all different difficulties, from easy hikes suitable for children to traverses that are among the toughest in the Northeast. Challenges like this and the 3500 Club are great for exploring new areas of the Catskills. 52 Hike Challenge - There are challenges like this all over social media. The underlying idea is to get you out hiking more often -- in this case, weekly. Between the local hot spots, remote peaks, bushwhacks and nature walks, there is no doubt that this challenge can be completed in Greene County. Karen and Jake conquering the Escarpment Trail on a guided backpacking trip with Catskill Mountain WIld. Once the excitement of day hiking has diminished, maybe you’re ready for a multi-day backpacking trip. While this requires a much higher level of planning, it’s well worth it and can open new possibilities for outdoor adventure. The Great Northern Catskills has plenty of routes that can be put together to spend multiple nights in the wild. Just like single day hikes, there are many backpacking options for people of all skill levels. Some popular routes are the Escarpment Trail and the Devil’s Path, but be sure to prepare accordingly before tackling one of these beastly routes. 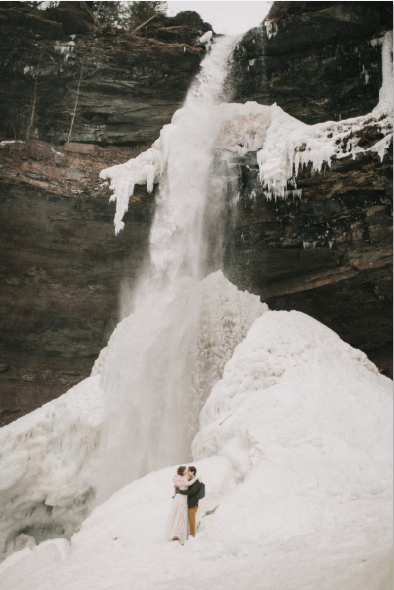 Lisa and Matt tied the knot in the off-season at Kaaterskill Falls on a guided “Wild Wedding” with Catskill Mountain Wild. CAUTION : Micro-spikes are necessary to access this portion of the falls throughout the winter. Trails in the Catskills can be enjoyed all year long. Hiking in the winter is truly magical as you trek through the deep snow. Try visiting some of your favorite summer spots in the winter, when the trails are less crowded and blanketed in fresh snow. However, winter hiking requires special gear and more preparation. Snowshoes will help you stay on top of the snow, making travel in deep snow easier and helping to keep your boots and pant legs dry. Micro-spikes and crampons are traction devices that go over your hiking boots and are a must-have when the terrain is covered in ice. For help increasing the difficulty of your hikes, winter hiking and gear rentals, learning how to use a map and compass to navigate bushwhacks, and finding new trails, contact Catskill Mountain Wild at CatskillMountainWild.com. There is a new adventure waiting for all ages and skill levels. Jeff Vincent is a licensed outdoor guide and owner of Catskill Mountain Wild, a local guide service offering custom outdoor adventures. He is a Catskill native and 3500 Club Member. He has thousands of miles of hiking experience including a thru-hike of the Appalachian Trail from Georgia to Maine. You can follow Catskill Mountain Wild on Facebook and Instagram and contact Jeff through CatskillMountainWild.com. All ages and skill levels are invited to hike, fishing, camp, paddle. survive and more with Catskill Mountain Wild.